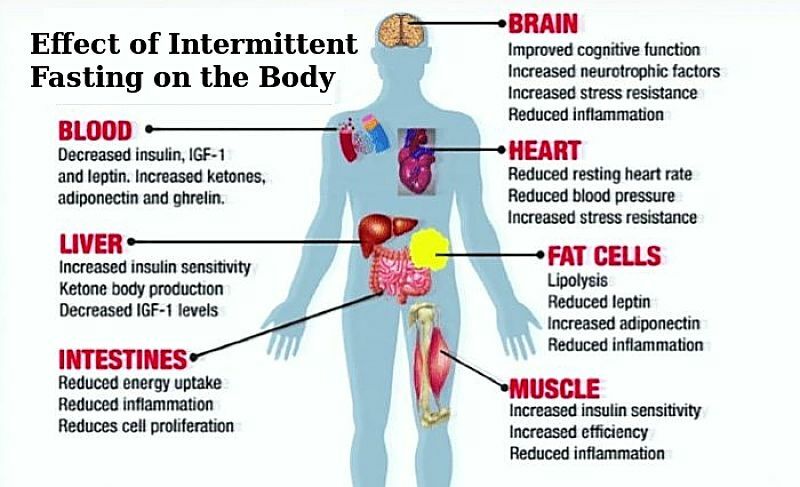 This article reviews the evidence on the effectiveness of intermittent fasting for Weight Loss, Health and provides several fasting diet plans. Intermittent fasting (IF) or regular fasting is a stop and go eating pattern which alternates between periods of fasting (during which only water can be consumed) and periods of non-fasting. There is evidence that intermittent fasting may produce health benefits, prolong life expectancy, help to cleanse the body. It is unclear whether these benefits are essentially due to the imposed caloric restriction (energy restriction) or to other benefits from a pause in eating. Fasting of various types has been practised for religious and lifestyle reasons by many groups and individuals. For example, Mormons generally fast on the first Sunday of every month and Moslems fast for 29-30 days during Ramadan (9th month of the Islamic calendar) during which they don't eat or drink during daylight hours. 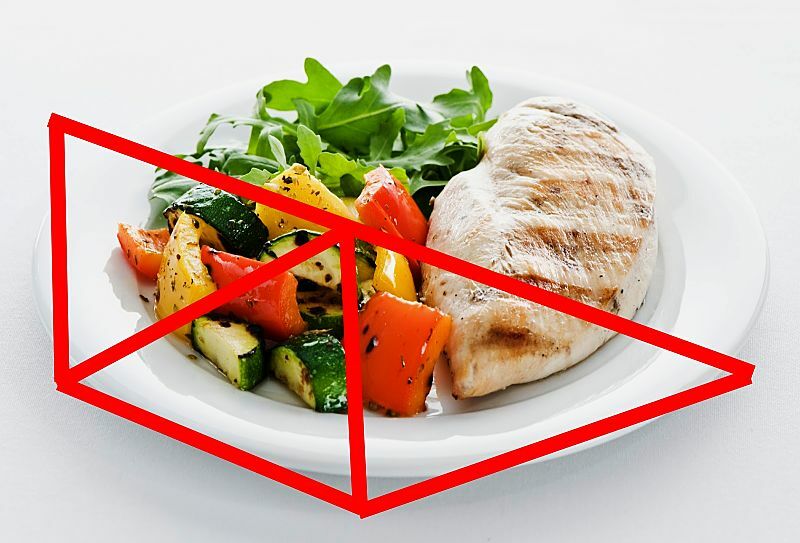 Many diets are built around stop-go-eat pattern and simply strategies such as 'Don't Eat Lunch'. Intermittent fasting (IF) usually means an eating food only every second day, but there are lots of variants that involve fasts once a week or skipping regular meals, for example only eating breakfast or skipping lunch. The last two are probably better referred to as 'regular' fasting. There are many other fasting patterns during each 24 hour period. Most people fast for 10 hours a day anyway, the interval from dinner and supper, overnight until you 'break the fast' with breakfast in the morning. This can be described as "10/14" regime 10 hours fasting followed by a 14 hour feeding period. 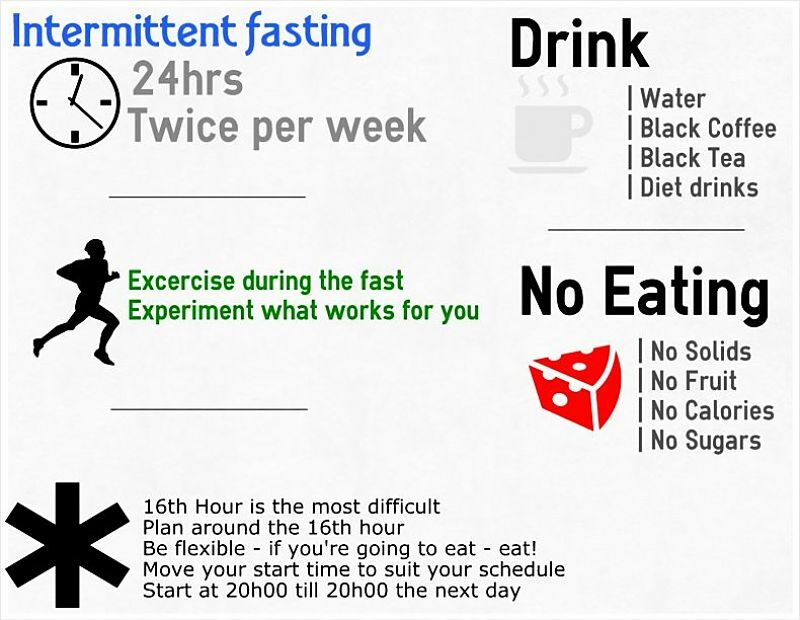 A "20/4" regime refers to 20 hours of fasting followed by 4 hours of non-fasting. Other patterns are "19/5", and "16/8" daily fasts. 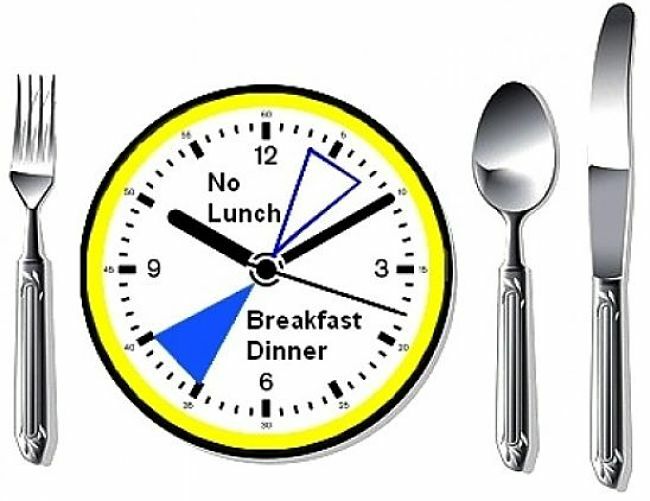 The skipping lunch method has two fasting periods, one overnight, the other throughout most of the day. It could be described as a "20/4" or "10/2/10/2" with two periods of two hours for breakfast and dinner. Fasting technically does not start to have an effect on energy stores until after about 12 hours without food. 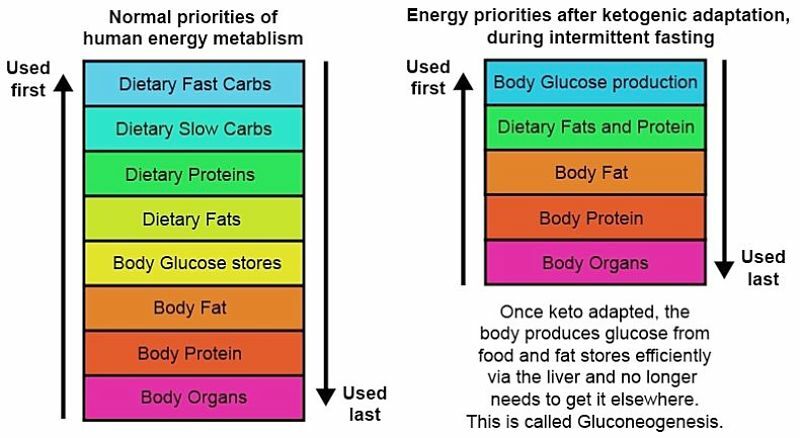 After this time the body will initially draw on carbohydrate stores and then fat to supply the body's energy needs. The fast will continue as long as carbohydrate and fat stores are used for energy. Once these stores are depleted the body will start to break down protein in muscles. When this happens a person is technically starving. If the fast takes 12 hours to begin to have an effect, how can short periods of fasting during a 24 hour period be effective? Fasting is a method for restricting calories. 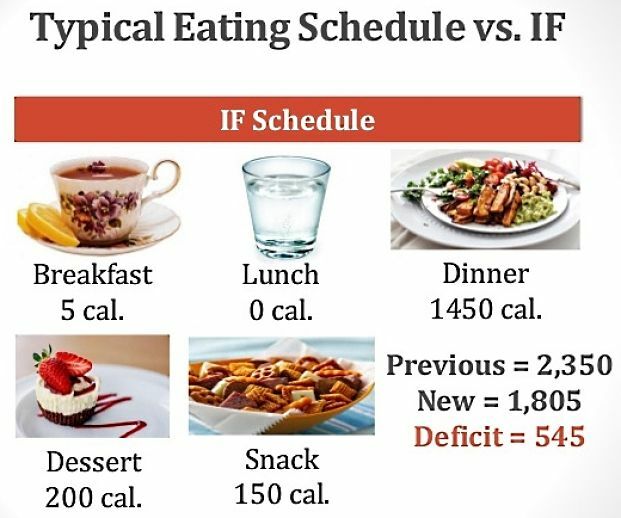 If you don't eat for 10 hours and don't make up for the lost calories when you start eating again, you will remain deprived of calories and so will stay fasting (deprived of calories over a 24 hour period). Not eating for long periods during the day may have other health benefits as well, which you won't get by eating three calorie reduced meals throughout the day. So fasting is a method of restricting your calorie intake and having prolonged periods without any food. A study conducted by the University of Adelaide in Australia is that intermittent fasting, (fasting every other day, with breakfast only on fasting days), lowers levels of cholesterol and other blood fats called triglycerides. Many Mormons fast for one day a month (they do not eat food on the first Sunday of each month). Research has shown that Mormons are 40% less likely than the general population to have clogged arteries. In a study of 515 people, about 60% of the fasters had heart disease compared to 67% of the non-fasters (after weight, age and other factors were taken into account). People who were not Mormons, but fasted in a similar way, showed the same fasting benefits as the Mormons. Studies of Intermittent fasting (IF) in rodents given food only every other day, showed increases in life span and reduction in the frequency of age-related diseases. 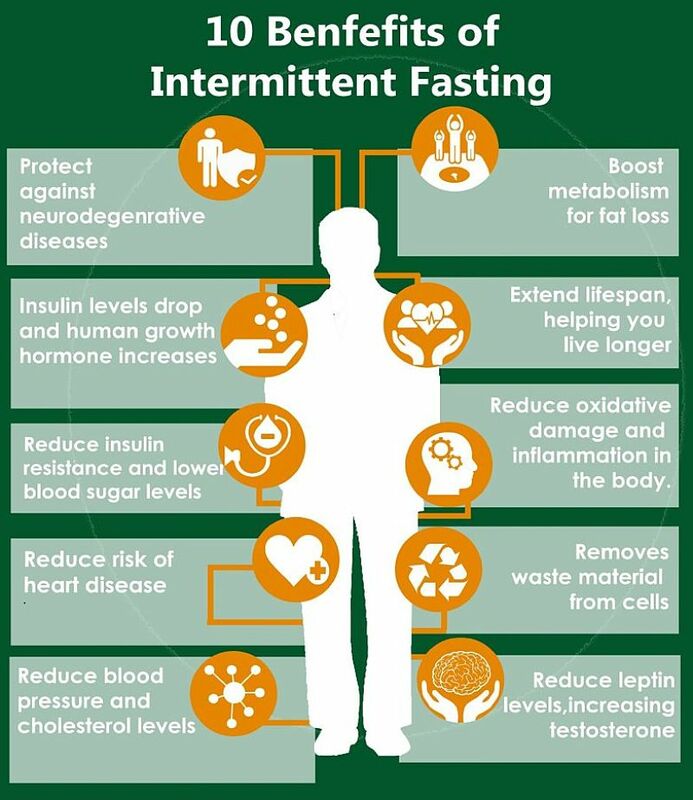 Numerous experimental studies of animals and human statistics carried out over the last 15 years suggest that periodic fasting can have major outcomes for weight loss (fat reduction), overall health and longevity. A recent study published in the American Journal of Clinical Nutrition reviewed these research studies and found that the major benefits were in improvement in insulin sensitivity and glucose uptake, reductions in blood pressure, reduction in oxidative damage to protein, lipids and DNA, as well as weight loss benefits (decreases in fat). Animal studies of Alternate Day Fasting (ADF) found lower diabetes incidence and lower fasting insulin and glucose concentrations. These effects were comparable to those of Calorie Restrictions (CR) diets. Human trials so far have reported higher insulin-mediated glucose uptake, but no impact on fasting insulin or glucose concentrations. Findings in animals studies suggest that ADF may effectively reduce several risk factors, thereby helping to prevent chronic disease,. Also ADF may modulate disease risk to similar extent to that of CR. More research is required to establish definitively the impact of ADF. One issue for the intermittent fasting studies is that slightly overeating on the non-fasting days (to make up for the lack of calories on fast days) yielded similar results, so it wasn't so much about total calories consumed as it was about the periods of being deprived of food. There is no human evidence to date, yet animal studies found longer survival after tumour inoculation, decreases in lymphoma incidence, and lower rates of proliferation of several cancerous cell types. Animal ADF research study data showed lower tri-glycerol and total cholesterol concentrations, lower heart rate incidence, improved cardiac response to myocardial infarction, and lower blood pressure. The limited human evidence suggests higher HDL-cholesterol concentrations and lower triacylglycerol concentrations, but no significant effect on blood pressure. How does the Body Respond to Fasting? There has been a lot of debate about the body's response to fasting. Many claim that fasting does not work because to evokes the so called 'starvation response' - the body slows down the body's metabolic rate so that people do not burn the calories they expected. The 'stop-go-stop-go' eating merely triggers a 'slow-normal-slow-normal' change in metabolic rate so that the fasting has no effect. Lowering metabolic rate during starvation would appear to be a sound strategy increasing the chance that you may live long enough till you found something to eat. Most of this slow down would probably be through reducing the amount of activity (rather than resting metabolic rate) - a 'waiting it out' response. But starvation literally means exactly that starvation. Research studies have shown a reduction in metabolic rate of about 10% after 60 hours and others after 72-96 hours ( 3-4 days). Clearly, skipping a meal or not eating for 24 hours, every other day is unlikely to trigger this response. Though many people who try fasting do complain that they feel lethargic. All forms of calorie reduction diets are likely to cause this response and many successful dieters suggest that people should take positive steps to keep active and avoid becoming lethargic. Research studies have shown the exact opposite of this - short term starvation actually increases metabolic rate - again this seems sensible from an evolutionary point of view. In the study resting metabolism was monitored by indirect calorimetry, and hormone concentrations were assessed in 11 healthy and thin volunteers after 1, 2, 3, and 4 days of a starvation test. Resting energy expenditure increased significantly by about 15% on the third day. Norepinephrine concentration in the blood increase by about 50% between day 1 and day 4. Serum glucose declined by about 30%, whereas insulin did not change to any degree. The conclusion from this study was that resting metabolism increases in early starvation, and that this is accompanied by an increase in plasma norepinephrine perhaps triggered by the fall in blood glucose levels. This makes sense, considering how we evolutied, because norepinephrine, which is what gives you a "runner's high", sharpens the mind and stimulates activity. This would appear to an advantage in getting hungry people to look for food and to increasing the chance of survival. At some point, after several days of no eating and searching, when starvation has set it may be better to shut down and conserve the remaining energy. Despite the myths, the study showed that resting metabolic rate increased in short-term fasting (up to 60 hours) by about 10%. How does the body respond when deprived of food and there no incoming energy. The body must turn to its own resources, a function called autolysis. Initially the body uses glycogen, then starts breaking down fat reserves in the body to generate energy. The liver is the location where fats are converted into ketone bodies and fatty acids, which are then distributed through the bloodstream and are used for local energy production. While fasting for one or two days is rarely a problem people who are very overweight or those with known liver or kidney problems, should not fast. The same applies to anyone on any king of medication. Fasters trying to lose weight should still eat healthy food and follow the general guide of eating five fruits and vegetables a day, walking for 30 minutes a day, and drinking lots of water. To lose weight you have to consume less calories than you eat over a period of time. That is you need to go into calorie deficit mode. 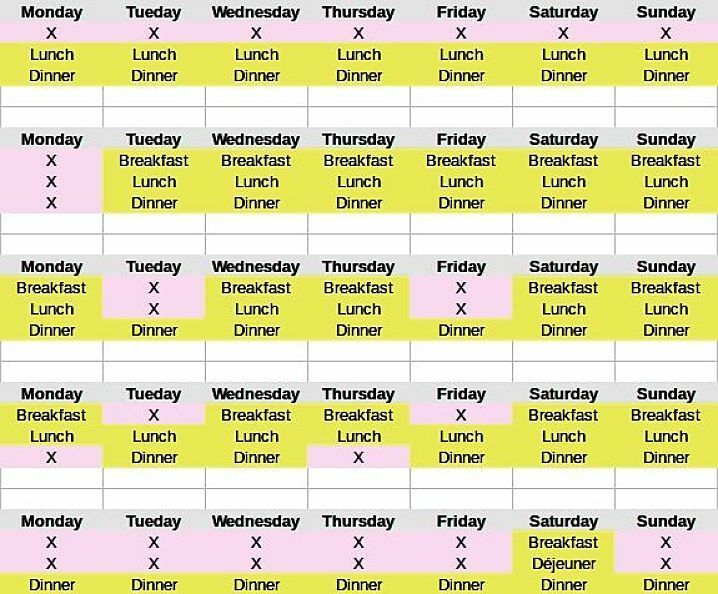 Most people try to do this by eating calorie restricted meals throughout the day such as the Eat Only the Better Half Diet. This is tough and very hard to maintain the discipline over a long period of time. Fasting methods such as 'Skipping Lunch' or not 'Eating during the Daylight Hours' may work better for some people. It means that you can eat normal meals at other times, which may be important socially as you can enjoy a normal evening meal with your family or at a dinner party. Counting calories is very hard to do. Oddly fasting may have psychological benefits as it has been used as a strategy to help people cope with stress and depression. Saying no to food can be the first step for people to take control of their lives. 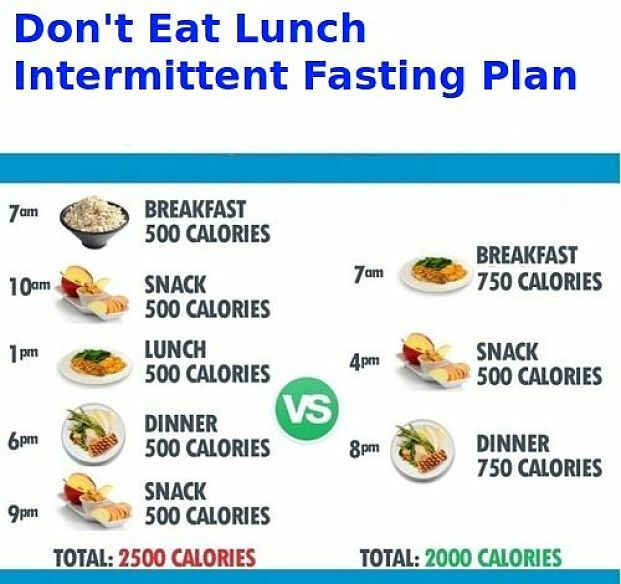 Fasting to reduce calorie intake is very simple. Cutting out one meal a day will reduce your calorie intake by about one third, which is just what you need to do to lose weight. Of course you need to be careful not to over-eat for the remaining meals. There are major review studies which have found that the major cause of the world obesity epidemic is what is termed passive unintentional over-indulgence. Stated simply this says that people in western societies get fat eating normal healthy food simply because the food we eat is too rich. The food we buy is highly processed and is stuffed full of calories, sugar and fat. It has a very high calorie density - this means there are a high number of calories in a small amount of the food. The secret to losing weight and keeping it off is to recognise that you must make major permanent lifestyle changes. This means eating a healthy diet, having regular exercise and learning to control yourself to avoid binges and saying no to junk food. One solution to this issue of the maintenance phase of dieting and 'keeping it off' may be to permanently not eat lunch - or simply eat an apple for lunch and go for a walk. Its worth thinking about and it does work for many people. After a while your body gets used to it and the 'hunger pangs' disappear. It is a simple strategy that avoid all the calorie counting and trying to eat half servings at every meal. Does Fasting Detoxify the Body and Promoting the Healing Process? There is a huge debate about these issues. Common sense would suggest that fasting should help to give your intestines a rest and this may also help your body focus on other things for a while such as repair and healing. After all the body is designed to fast; we fast for about 10 hours every night. Fasting allows the body to most effectively remove these waste products, especially for every other day fasts and longer periods of fasting. Many people throughout the world fast for spiritual and religious reasons. These benefits should not be overlooked. The Trial Fast - This is a good way to start. Just try going for 24 hours without any food but drinking as much water as you like. Skipping a Meal - This is easy to do - just try skipping lunch every day for 5-7 days and see how you cope with the hunger pangs. It may take a while but you will get used to it. Be patient - expect to take some time to get used to it. Exercise helps - don't let the lethargy get to you, try to maintaining a regular exercise routine. Progress slowly - allowing time for you and your body to adapt. Fasting is quite common amongst body builders, mostly for detoxing the body, promoting repair and muscle building after workouts. It is also used to enhance body shape changes and to lose fat and flab.